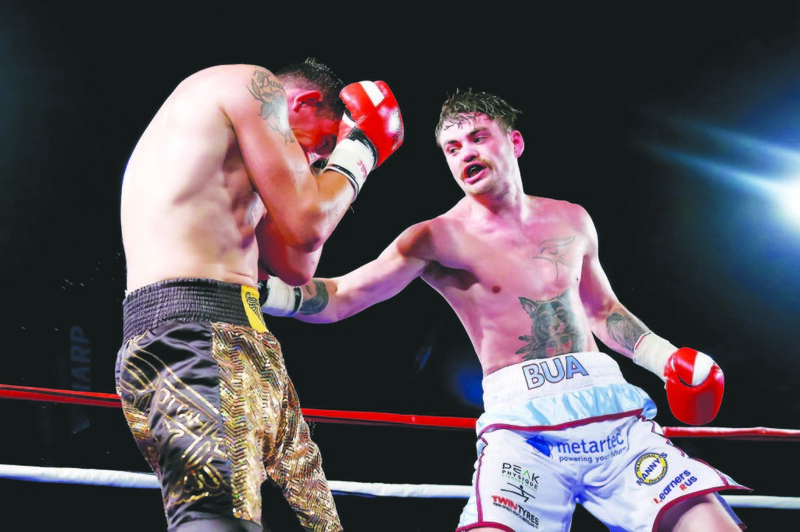 TYRONE McKenna insists he is ‘100 per cent confident’ of victory of Sean Creagh when the pair go toe-to-toe at Belfast’s Titanic Exhibition Centre on Saturday night. The domestic welterweight clash forms part of a sterling undercard for the ‘Homecoming’ bill featuring Jamie Conlan, Paddy Barnes and a host of Irish talent. One of the first fights confirmed for the mouth-watering bill was the clash between McKenna and Creagh and the hype surrounding the bout has been heightened by a war of words between the pair on social media. “It is a massive fight. Everyday, I am hearing people talk about it,” said McKenna. “It is an all-Ireland fight and there has been a lot said on Twitter between me and Sean Creagh – a bit of banter and slabbering. “It has brought a lot of hype. People are saying it is a 50/50 fight, we are both unbeaten. We are both fully confident we will get the win. “We have never tasted defeat. There is a lot on the line. “I am 100 per cent confident. I have had a great amateur career. “I have been all over the world. I don’t think he will be prepared for what I bring to the table. Based in Philadelphia in the early stages of his career, McKenna is now with Matthew Macklin’s MGM Gym in Marbella. He believes his greater experience and ring-craft will help him overcome Dubliner Creagh on Saturday night. “I have got everything on my side,” said McKenna. “I’ve boxed for longer than he has. I have had more fights and I have won harder fights. I have had a couple of six-round fights – he has only had four rounders. “Preparations have being going perfect so far. I had a 12-week camp and I have been training in Liverpool for five weeks. I had a six-round fight with Danny Little in between the camps so I feel sharp. Saturday’s fight also sees McKenna box in Belfast for the first time since last’s year’s Féile in the Falls Park and the Lenadoon native is relishing the prospect of securing win number 12 of his pro career in his home city. “I haven’t fought in Belfast since last August at Féile. I haven’t had the opportunity to box in Belfast in a while. While Saturday’s card represents another step on the road to a British title shot for McKenna, fellow Belfast fighter James Tennyson is aiming to bounce back following his defeat to Ryan Walsh in their British featherweight title showdown last April. ‘The Assassin’ suffered a further set-back in August when he sustained whiplash in a car accident. However, the Poleglass native says he is chomping at the bit and ready to take on Jose Aguilar this weekend. “Preparations have been going well,” said Tennyson. “Everything has been on point and going according to plan so I just have to get the weight right and get the job done. “After my British title fight, I took a bit of a break. I was back training away, just doing bits and pieces and I ended up in a car crash. That put me out for a while but I am back now. “I think the break has benefitted me. I am well rested. I have no complaints. I have been working really hard and I have been putting the work in. Tennyson also stated ‘the weight beat me out of the fight’ when recalling April’s KO defeat to Walsh at the Cooper Box Arena in London. However, he already has his eyes on an Irish super-featherweight title fight against Declan Geraghty, who takes on Khvicha Gigolashvili on Saturday’s bill – provided they both win their respective bouts. “It is a great bill with some great fighters and it is great to be a part of it,” added Tennyson. Unbeaten Belfast southpaw Joe Fitzpatrick will also be in action in the National Stadium in Dublin on Saturday with an opponent set to be confirmed later this week.